Secluded in the wooded grounds of Arden House by the shores of Loch Lomond is the row of Gardener's Cottages built on one side of a magnificent Victorian walled garden. Avril and Andy MacLeod rescued and replanted the garden and care for it today. They live in one cottage and have restored the other three, available for self-catering rental accommodation; Linnhe and Lomond are ideal for families or friends (sleeping 4 to 5 each), and Luss is a perfect hideaway for two. Around about there's plenty of walking, mountain-biking, horse-riding, sailing, fishing and golf. The sea at Oban, Glencoe, the Trossachs, Stirling and Edinburgh are all within 2 hours drive, and Loch Lomond is only 20 miles North of Glasgow. The cottages are only 6 miles from the picturesque village of Luss and world famous Loch Lomond Golf Courses. In Balloch (3m) you will find the galleries, shops, cafés and bars of Loch Lomond Shores and Drumkinnon Tower as well as restaurants, shops, tourist information, boat trips on the loch, a Farmers' Market, and even a mini IMAX cinema. But it's the breathtaking scenery of the surrounding 720 square miles of The Loch Lomond and Trossachs National Park that makes this place so special. And Loch Lomond itself, immortalised in the well known traditional Scottish Song "The Bonnie Banks o' Loch Lomond" , is indeed one of the most beautiful lochs in Scotland. The cottages are warm, comfortable and full of character. 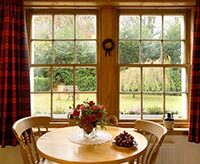 They look out onto an enclosed area of lawn, trees and shrubs where you can often see rabbits and squirrels while you are having breakfast, or in Spring, families of ducks wandering about on expeditions from the loch which is about a hundred yards away.